Milorganite is one of the oldest fertilizer brands, produced by the Milwaukee Metropolitan Sewage District. This district runs one of the largest recycling centers by collecting water from the Milwaukee Metropolitan area and treating it with microbes. These microbes digest any nutrients found within the water, then die. This allows the now clean water to be returned to Lake Michigan. Additives are then added to clump the dead microbes. These clumps are then dried under extreme temperatures of 900-1200 degrees (which kills anything that may still be living). Milorganite is then tested numerous times before being packaged and shipped out across the nation. 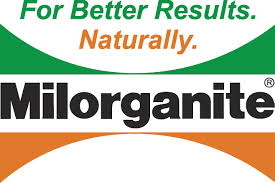 Milorganite adds organic matter to the soil which is essential for all plant life. The nutrients within Milorganite are released as the plant needs them (microbial activity), typically when the soil is moist and the soil temperatures are between 55-85 degrees. A majority of the nitrogen in Milorganite is not water soluble so the roots only receive it through microbial activity. A well conditioned soil is essential for a healthy lawn. With 85% organic matter, Milorganite assists in adding organic matter back into the soil. Many nutrients that are released into the soil throughout the year come from the organic matter within the soil. Milorganite is a slow release soil fertilizer. Slow release fertilizers benefit a plant by releasing the nutrients over a long period of time, opposed to quick release fertilizers that give the lawn an instant boost of nutrients. Slow release fertilizers help to provide for a better lawn by promoting a thicker turf and a thicker turf is able to withstand weeds better. Slow release fertilizer also builds a stronger root system and help the lawn grow evenly. Like other organic fertilizers, there is very little to no risk of burning in the summer. The high salts in a synthetic fertilizer set up the risk of chemical burn during heat and humidity; this is not the case with Milorganite and other organic fertilizers as they are typically lower in salts. A good percentage of organic matter can act as a sponge and holds water to help through the summer months as it releases most of the water it holds back into the plant. It will also help to reduce erosion within the lawn. To sum it up, Milorganite is a recycled organic product that helps to naturally and slowly release nutrients into the soil. Milorganite also helps to add organic matter to the soil to reduce erosion and hold water for future needs of the plant.